Halloween is the time of year where people look forward to eating all their favorite sweets for a week straight. As delicious as they can be, it also fun to make your own! 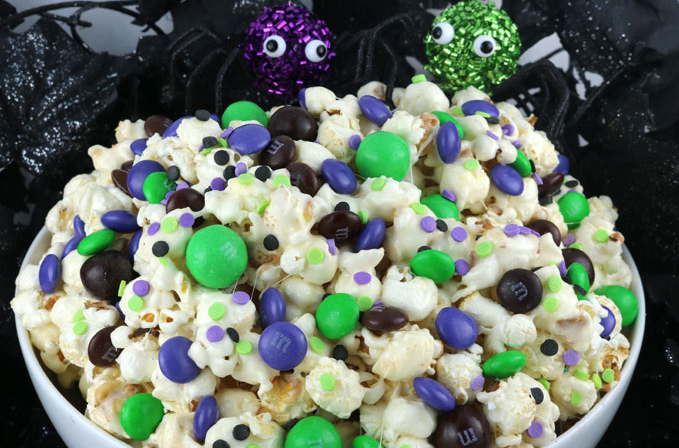 Whether it be for a Halloween party for thirty people or three, these sweet recipes are sure to spook and satisfy. Have the kiddos help out and they may have a whole new appreciation for their favorite candies too! Did someone say devil’s food cake? Only a cookie so sinister would call for it! These tasty morsels are fun to make, pretty to look at, and too good not to eat! Preheat oven to 350 F. In a large bowl mix cake mix, oil, and eggs until soft dough forms. Shape dough into 1 inch balls. Place balls 2 inches apart on ungreased cookie sheets. Bake 8-10 minutes or until set. Cool for 5 minutes and move cookies from sheet to cooling rack, letting them sit for 30 minutes. While cookies cool, divide frosting into 3 small bowls. Tint frosting as desired with food colors. Place frosting in zipped sandwich bags, cutting the tip of each bag for piping. Pipe 1 inch wide circle of frosting on top center of each cookie. Sprinkle frosting with candy sprinkles. Press 1 milk chocolate candy into frosting on each cookie. Let out one large witch cackle and then eat! Halloween can be more than just the color orange! This bewitched popcorn is the perfect blend of salty and sweet. It’s so wicked tasty it’ll hypnotize your loved ones into coming back for seconds. OooOooo! Pop popcorn and immediately sprinkle with a few dashes of salt. Remove un-popped kernels from popcorn. In a pan, melt butter and then add mini marshmallows. Stir until marshmallows are melted and turn off heat. Slowly pour 90% of the marshmallow mixture over salted popcorn. Gently fold the marshmallow until popcorn is mostly covered. Pour the popcorn mixture onto a cookie sheet covered with foil. Drizzle remaining marshmallow mixture on top so the candy will have something to stick to! Quickly add the candy and sprinkles evenly over popcorn. Once cooled, this eye-catching snack will be ready to eat and devoured before your very eyes! Mwahaha…. Calling all candy lovers! Why choose to enjoy one delicious sweet treat when you can have them all in one bite? This bark is the perfect solution for those who want it all. Line a baking sheet with parchment paper. Melt the chocolate chips using a double boiler or in the microwave, stirring until smooth. Pour the chocolate onto the parchment paper and using a spatula, spread it into an even layer about ¼ inch thick. Sprinkle the assorted candy on top of the melted chocolate, then place the sheet in the refrigerator for 30-45 minutes. Once the chocolate has fully hardened, remove the bark from the refrigerator and place it on a cutting board. Cut the bark into irregularly shaped pieces and serve. The sugar rushes that follow will surely scare you!!! 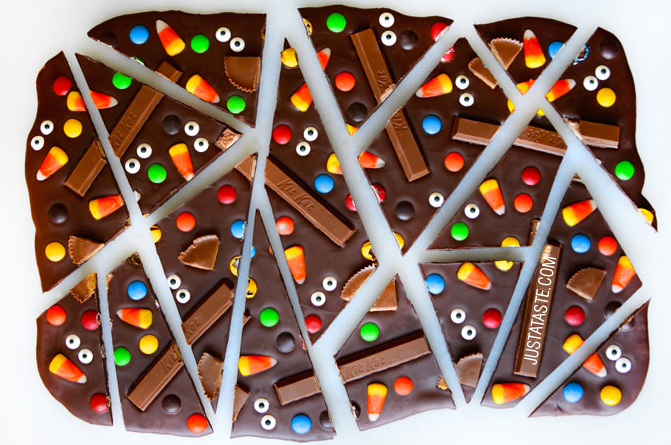 This is a fun twist on a classic Halloween candy. Created in the 1880s, Candy Corn has certainly come a long way with seasonal holiday colors beyond yellow, orange, and white. For this easy recipe, Candy Corn is elevated to a whole different level of tasty! Make lemon gelatin according to directions. Add 1/3 cup of lemon mixture to glasses and refrigerate for 2 hours or until firm. While lemon gelatin cools, make orange gelatin. When orange gelatin cool and lemon gelatin is firm, slowly pour 1/3 cup orange gelatin on top of the lemon. Place back into the refrigerator until firm. 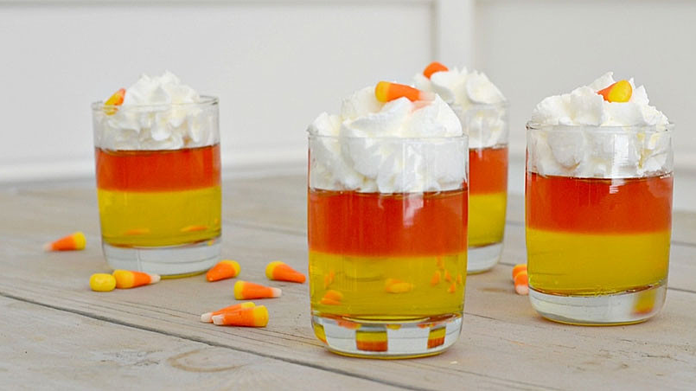 Once orange layer is firm, add a layer of whipped and top with a piece of Candy Corn! For those who do not enjoy eating actual Candy Corn, this recipe is nice alternative. These spiders are sure to turn anyone with arachnophobia! Just look at those goofy eyes! 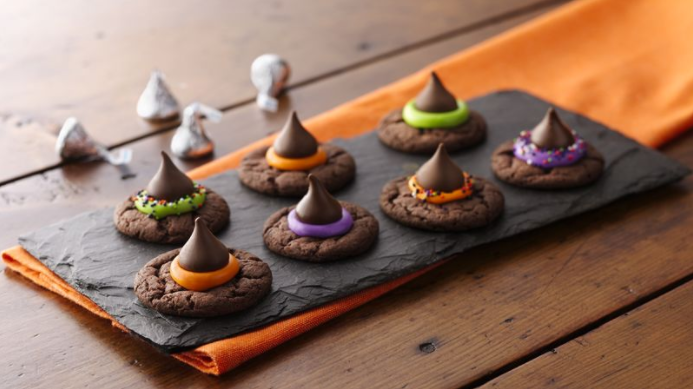 The only thing scary about these cookies is how quickly they’ll disappear. Preheat oven to 375 F. In a large bowl, beat together shortening, peanut butter, egg, brown sugar, sugar, vanilla, and milk. In a medium bowl, whisk together flour baking soda, and salt. Gradually add dry mixture to wet mixture and beat until blended. Form into 1 inch balls. Roll in sugar and place a couple inches apart on ungreased cookie sheet. Bake 10-12 minutes or until golden. Immediately, gently press an upside down frozen peanut butter cup on the top of each cookie and move to wire rack to cool. After placing and moving all of the cookies on the wire rack, put in place the candy eyeballs while chocolate is still slightly soft. 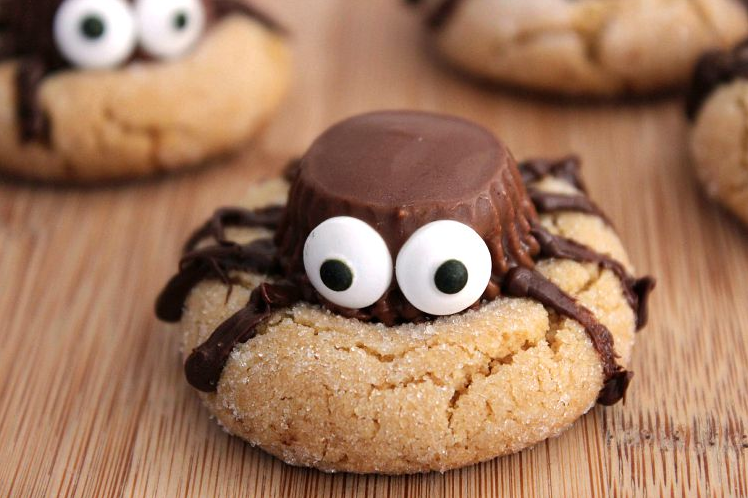 Using chocolate frosting to draw eight legs on each spider cookie. Place in refrigerator for 10 minutes and then serve. Grab a few and enjoy- these little critters won’t bite! If you enjoyed these recipes and would like to find more Halloween party ideas, check out our Halloween Pinterest Board and follow us on social media.